Free to Read on Kindle Unlimited. When injustice tries to kick down your door what do you do? For Maddie and the Golden Spur Hotel it means rolling up your sleeves and beleiving in a love thaat can conquer even death itself! 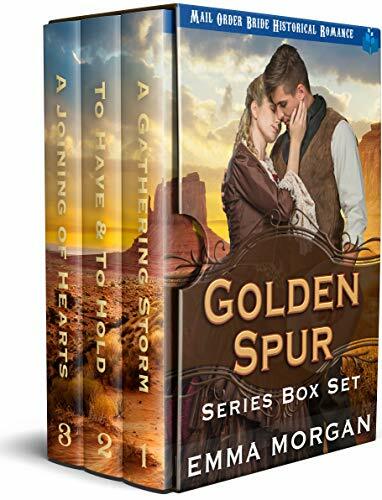 Read the complete trilogy in The Golden Spur Complete Series Boxset! Maddie is left with a half-finished hotel, no finances and a corrupt man running the town of Bannack. Her refusal to cower to Adam Reid causes untold hardship until a Good Samaritan and his buddies decide to take on the corrupt forces controlling Bannack. Maddie had been hoping for a savior, and ever since handsome Kieran rode into town and rallied the men to save her hotel, she has been unable to deny the pull he has on her heart. Now he has left her alone, hunting down the outlaw gang, and an old love has returned to try to sweep her back to the East. And just when Maddie begins to dare hope she could be happy in this faraway town, tragedy strikes—leaving her more alone than ever. Now she must wait, praying for Kieran’s safety while he fights his way back to her, and her arms, to have and to hold. Maddie is almost ready to hope for a peaceful life. The town of Bannack has been cleared of the outlaw gang, and only the leader—Adam Reid—remains to be flushed out and rounded up. Kieran has returned to her safely, and though she is still overwhelmed by the death of her close friend and the needs of the child she most now raise, Maddie finally believes that maybe now she can make her way in this faraway, frontier town. But Adam Reid is not ready to relinquish his control on the town—or on Maddie. He hatches a plan that will ensure his success and give him power over the town again once and for all. Can friendship and faith defeat the greed and power that has held sway over Bannack for so long? Find out in this final installment in the Golden Spur series!